A Chromebook is a personal computer that runs Chrome as an operating system. The device is made to connect quickly to the Internet and supports apps that are on the web, not ones that are downloaded to the device. Students can use productivity tools on the web that allow them to access their work anytime and anywhere. 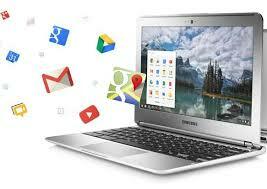 Students can use the Chromebooks to access Google Apps. Below are some examples of the ways that the students cam work in the cloud using the Chromebooks. Using Chromebooks, students can communicate using 21st century tools. Collaboration is one of most important 21st Century skills that we can teach our young students. The Chromebooks allow students to collaborate face to face or on the computer while working on projects.